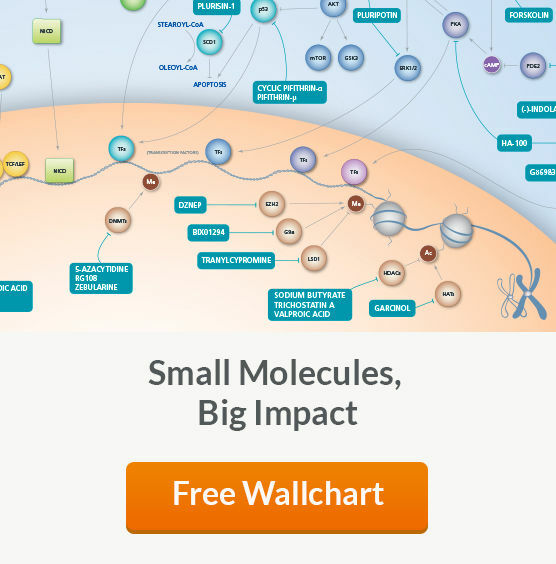 Small molecules are increasingly being used as tools to modulate signaling pathways and understand cell biology. Whether to regulate stem cell biology by affecting reprogramming, self-renewal, or differentiation, or to better understand mechanism of cancers by targeting tumorigenic signaling nodes, the right small molecule can transform a research project. STEMCELL Technologies offers small molecules that are being widely used in high impact research to target the key pathways in stem cell biology. CELL PERMEABLE. Can affect signaling pathways within the cell. SIMPLE. More stable and cost-effective than growth factors. CHEMICALLY DEFINED. High purity and low lot-to-lot variability in activity. TUNABLE. Effects can be finely tuned by varying concentration.